When we think of bedding, our thoughts usually jump to the color or pattern of the comforter or the arrangement of the pillows. But the bed skirt is an important element not to be overlooked. Here are some tips on how to fit your bed skirt and choose the best type for your room. 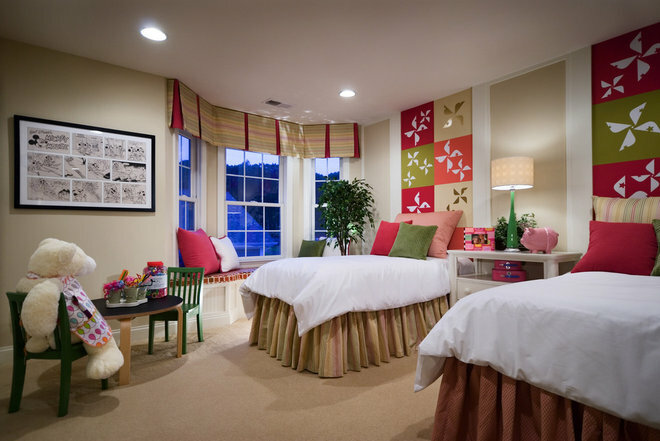 Bed skirts are generally attached in one of two ways: anchored under the mattress or by Velcro, which is handy for certain types of beds when anchoring under the mattress is impractical. Fabricating the decorative skirt with a “decking” made of drapery lining and sliding it completely under the mattress keeps everything in place so you’re not constantly re-dressing the bed. When making a bed skirt with a decking, or having one made, consider the edge between the skirt and the mattress. Be sure to extend the decorative fabric at least 4 inches into the decking so that if any shifting occurs, you don’t risk exposing the muslin. 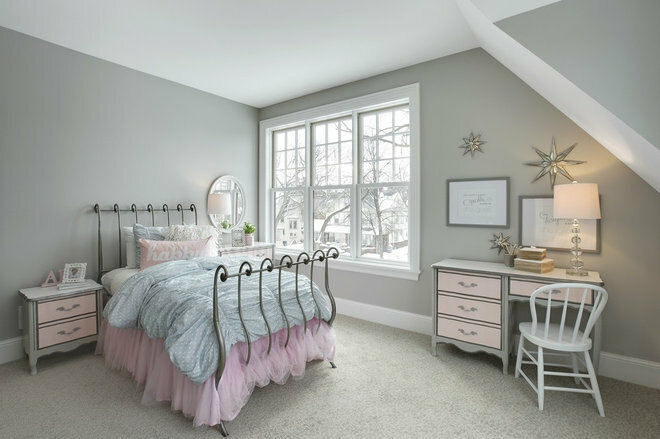 Bed skirts are usually constructed to fall from the top of the box spring to the floor, but on some beds that distance is greater than others. A custom skirt might be required. 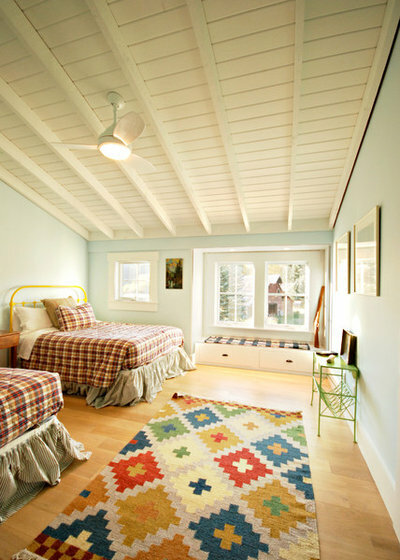 Here, a separate fabric was chosen for the two beds, giving each its own personality in a room with a tight color palette: One wears a stripe, the other a small-scale print. 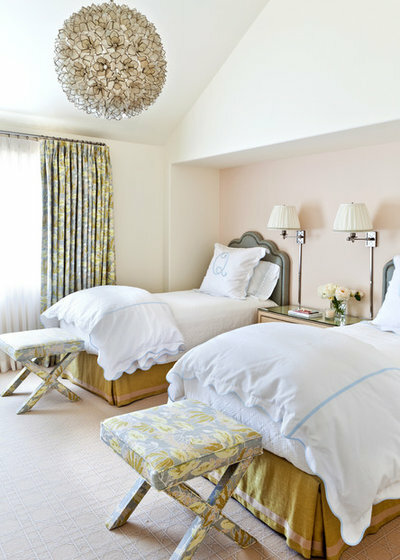 Both patterns are customary choices for bed skirts, since smaller prints and solids are the easiest to style around. The gathered bed skirt is one of the most popular choices, perhaps because it happens to be the most widely available at stores. 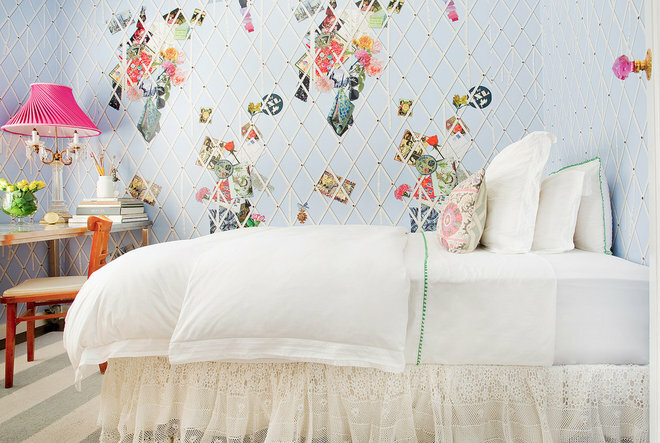 It’s always a stylish idea to duplicate the bed skirt fabric as a pillow on the bed. 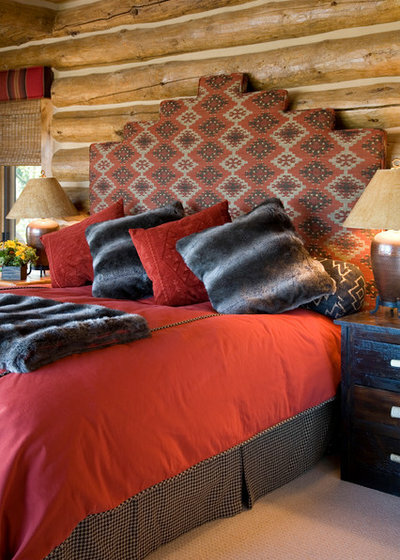 Though you need only one matching pillow, you’ll often see an entire layer of pillows that match the skirt. Gathered bed skirts can be customized by trim (tassels, beads, a fabric band or flat tape along the bottom) or by fullness. The ability to boost fullness is the domain of custom fabricators, and if you choose to go this route, you can elect to have your bed skirt pool (or, “puddle,” as it’s known in the industry) on the ground. 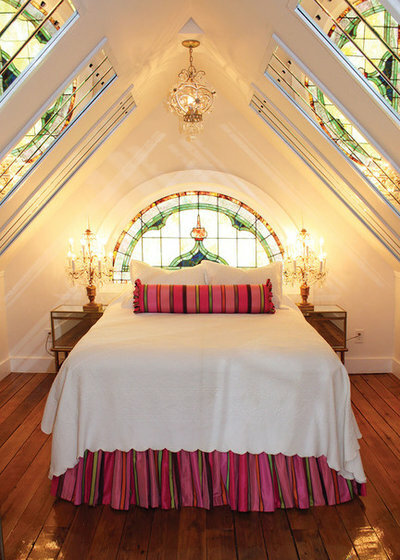 It’s a look one would expect to see in opulent French interiors, but this photo shows how the puddled style can be used to great effect in a casual setting that lets guests know they can let their hair down here and not fuss with hospital corners and other hallmarks of bed-making perfection. Speaking of pattern, the short height of bed skirts, usually only 14 to 18 inches, has many convinced that large-scale patterns with huge repeats are off-limits. While it’s true that extra care should be taken with pattern placement to ensure that the motif doesn’t get awkwardly chopped or disappear entirely within full gathers, a large pattern can work nicely in a box pleat. Box-pleat skirts like this one are especially fun to design because they can accommodate a contrasting fabric in the folds. 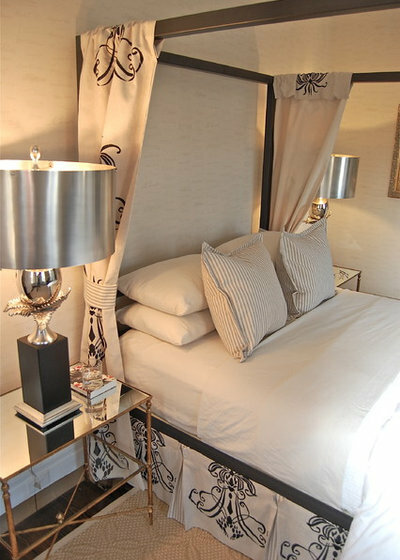 Here, the ticking stripe within the pleats coordinates with the two decorative pillows to pull the whole bed together. Pleated corners afford the skirt some movement or “give” so that the fabric isn’t simply pulled taut, ready to bust its seams if someone kicks it while stepping into bed. If your bed has posts, you’ll want to specify “split corners.” The front and side flaps of the pleat will then simply fall to the sides of the posts. The bed in this photo is post-free, so a flap of fabric called a gusset was sewn to the back of the pleat so there’s no glaring gap in the fabric. The tailored bed skirt is another popular style. As the name suggests, it’s less full and ruffled than the gathered type, and it tends to veer toward the transitional. You’ll usually find tailored skirts with a single center pleat on all sides, though smaller beds can forgo the center pleat at the end of the bed. Most bed skirts are made three-sided, which saves money by eliminating superfluous yardage on the side of the bed that’s likely to face a wall. 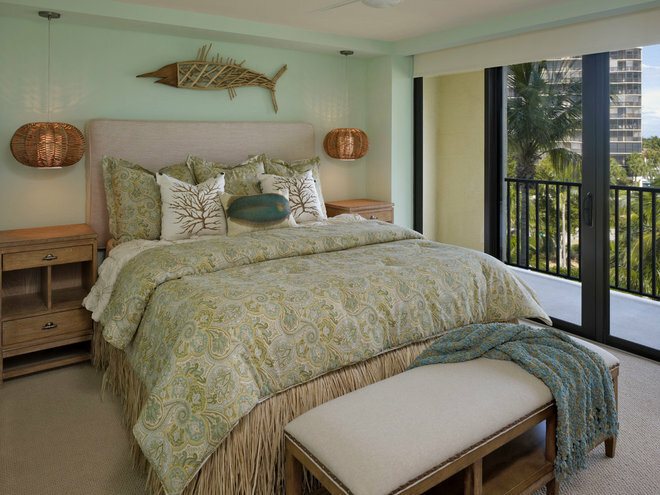 Tailored bed skirts can truly suit any decor, but they often work well in more streamlined and gender-neutral spaces. While gathered bed skirts can start feeling frilly beneath a lot of decorative flourishes and mountains of pillows and textiles, a tailored skirt is right in line with minimal bedding in solid colors. This tailored skirt is trimmed in a wide tape that peeks out from the bottom of the frame, and you’ll notice minimal bunching around the post. Lace skirts deserve a category all their own. The softly draped nature of bed skirts (also known as dust ruffles) and their status as an accent make them a fine choice for experimenting with fabrics and materials that struggle to find a place in the modern home. Lace bed skirts give a touch of antiquity to an otherwise crisp hotel-style bed ensemble, a charming juxtaposition in the right setting. A favorite alternative bed skirt material for a little girl’s room is tulle: If ballerinas’ skirts can be made out of it, why not bed skirts? Finally, a personal favorite and offbeat choice: grass. Make your own by banding together a double layer of hula skirts for a relaxed, tropical vibe.